"The one thing I do know about murderers is that they can never let well alone." 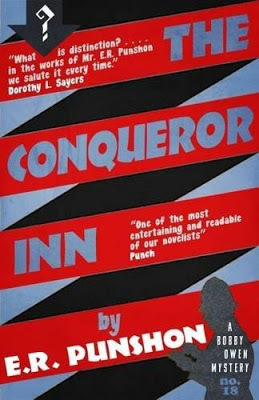 The Conqueror Inn (1943) is the eighteenth entrée in E.R. Punshon's decades-long series about a rising policeman, Inspector Bobby Owen of the Wychshire County Police, which was praised by Anthony Boucher in The San Francisco Chronicle as "rewarding for its solid construction" and "the distinguished characterization" of an Irish patriot. It's definitely an interesting and noteworthy addition to the shelf of war-time mystery and crime novels from the 1940s. At this point in his career, Bobby Owen is doubling his role as the chief of the Midwych County C.I.D. with the post of secretary to the chief constable, Colonel Glynne, who was growing "more and more used to leaving everything to the young man already recognized as his successor" – which should have bound him to a paper-strewn desk. The key word here is "should," because Owen is on an errand that should have been confided to a subordinate. This errand leads him to a remote watering hole in a lonely, desolate spot of his district. Mr. Christopherson is the philosophical-minded, but taciturn, proprietor of the Conqueror Inn, which alleges "to be the oldest licensed house in England" and legend tells how William the Conqueror was served wine there. However, the building was torched to the ground, during a skirmish between Highlanders and Dragoons, after which a new structure was erected in 1750. So none of the subsequent owners possessed the paperwork necessary to substantiate their historic claim. 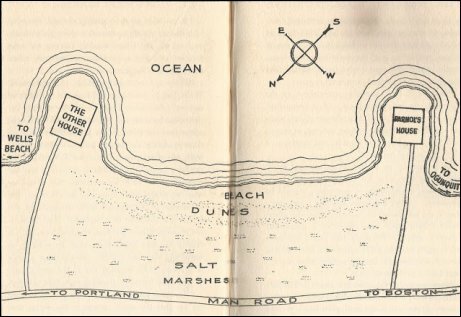 What brought Owen to this remote and desolate place was a strange phone call from the present landlord: Mr. Christopherson placed a phone call to the police, requesting an experienced officer, because he had found a wooden box crammed with "tightly packed bundles of one-pound notes" – a grand total of two thousand pounds. A nice chunk of money in those days, but that’s not all the landlord stumbles across. Not far from the road where he found the box is "a new dug grave." So they open the grave, but even Bobby is shocked by what he unearthed. The makeshift grave contains the body of a man, "stripped of every shred of clothing," with a single bullet hole directly over the heart, but the horrifying aspect is that "the dead man's face had been battered out of all resemblance to human features." As a result, Bobby finds himself faced with an unusual kind of problem: having to figure out who had been killed? There are a number of possibilities: one of them is the son of the landlord, Derek, who went missing on the battlefield of Dunkirk, presumably killed, but evidence surfaced suggesting he might have survived. If this is the case, it becomes obvious that his family has been hiding him from the authorities, which also gives rise to another possibility: might the confused, shell-shocked young man might have shot the faceless man? After all, Bobby found evidence of an attempted burglary at the inn. Another candidate for the role of corpse is a young Irishman, Larry Connor, who came over from the Emerald Isle to enlist, but was rejected by the R.A.F. and seems to have gone missing not long thereafter – which is disputed by his uncooperative uncle, Micky Burke. Bobby finds that nearly everyone involved in the case is annoyingly unaccommodating: the landlord and his daughter, Rachel, talk about as much as a brick wall. Rachel even openly defies Bobby and this throws the prowling policeman in a sulky mood ("women never play fair"). Bobby also encounters a military man, Captain Peter Wintle, who sustained a black eye around the same time as the victim received a sound thrashing, which was two days before the murder, but the captain refuses to slip any information to the inspector. It's noted at the end of the book that this needlessly complicated the case. Finally, there are Mr. Merton Kram and his daughter, owners of a lorry company, who seem to have a marked interest in the outbuildings of the inn. But are they involved in the murder? So the slightly frustrated police-inspector has to piece to truth together from allusions, half-stated truths, a forged letter, a buried service revolver and burning candle on a mantel piece – all of them, somehow, tied to the box full of one-pound notes, black marketeering and a possible plot from Irish revolutionaries. This makes for one of Punshon's typically complicated, but niftily executed, detective stories that run all over the place. But his plots always seem to manage to land on their feet. So I was very pleased with the overall story, but the reader has to be warned about one aspect of the plot: the revelation of the murderer’s identity and motivation is anti-climatic, because it turns out to be a rather simple, sordid and even modern kind of crime. One that was complicated by the mutilation, burial and the other aforementioned plot-threads. Some of you might respond with: "What? That's all?" It makes The Conqueror Inn perhaps more of a crime novel than a proper mystery, but I really liked the story as a whole. As you've probably noticed by now, I have a huge soft spot for these war-time detective stories and there was enough here to forgive that weak spot. Note for the curious: Dean Street Press has previously reissued two other very interesting and excellent World War II mysteries, which are respectively Harriet Rutland's Blue Murder (1942) and Ianthe Jerrold's There May Be Danger (1948). Both of them come highly recommended. "Sometimes... I think that the War has had a bad effect on some of our young men." 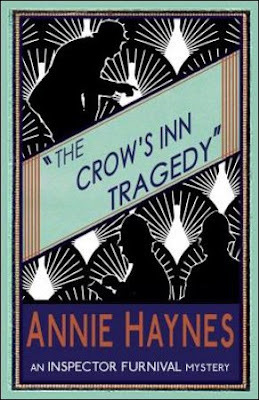 Annie Haynes' The Crow's Inn Tragedy (1927) is the third installment in a short-lived series of mystery novels, which marked the final appearance of Detective-Inspector Furnival, who previously helmed The Abbey Court Murder (1923) and The House in Charlton Crescent (1926), but he was given an early retirement in favor of Detective-Inspector William Stoddart – who burst on the scene in The Man with the Dark Beard (1928). 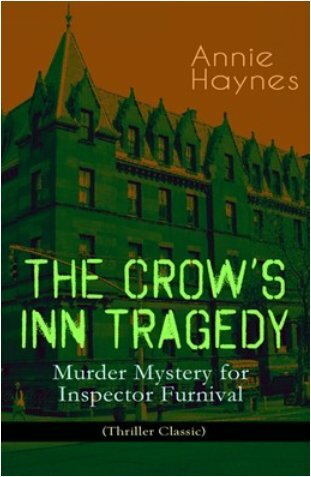 The Crow's Inn Tragedy can also be read as the end of the first phase of Haynes' career as a mystery novelist, which covered five standalones and the Furnival trilogy. After those seven detective stories, Haynes appended her bibliography with four additional titles about Detective-Inspector Stoddart and the last two were published posthumously. So the subject of today's blog-post is an overlooked, but important, milestone in the life and career of Haynes. Let's get started! One of the primary backdrops of the story is an old-fashioned, dingy and worn solicitor's office, located on the first floor of a corner house of Crow's Inn Square, which "evidently not had a coat of paint for years" and bare of any modern innovations or conveniences – making the place feel like a holdout from the late 19th century or early 1900s. It's in this "indescribable air of gloom" that the head of legal firm, Mr. Luke Bechcombe, receives his brother-in-law, Reverend James Collyer. Occasionally, Mr. Bechcombe provides some of his clients with a special and discrete service: he disposes of their valuable stones and substitutes them with paste. As a rule, these clients consist of society women, who overdrawn on their allowance, but refuse to tell their affluent husbands that they raked up a debt that their pocket money can't cover. But now his brother-in-law wants to dispose of a valuable and precious family heirloom, the Collyer Cross. The emerald studded cross is a treasured and precious religious artifact, "gleaming with baleful, green fire," which the clergyman wants to convert in cash in order to payoff the debts incurred by his son, Tony. Tony Collyer served in the trenches of the First World War, but the war "played ruination with the young men just beginning life" and England, "the home of heroes," had "no use for her heroes now" – which is why his father does not want to be too hard on the boy. Rev. Collyer wants to give his son a clean start, because he has "an inducement now that he has never had before." Tony is, sort of, engaged to Mr. Bechcombe's secretary, Cecily Hoyle. However, Mr. Bechcombe has some bad news for his brother-in-law: the emeralds are a paste substitute and this is when an important plot-thread is introduced: Bechcombe tells there have been "as many jewels stolen in the past year in London" as "in twenty years previously." The suspected party in these thefts is a well-organized group of criminals, known as the Yellow Gang, who are headed by a figure referred to as the Yellow Dog. This plot-thread dangles inconspicuously in the background of the story and only takes the center-stage during the final chapters, but more on this gang-related plot-thread later. In the meantime, there's another problem requiring the attention of both the police and the reader: Mr. Bechcombe is strangled to death in his private office and his death is surrounded by questions. Why had his managing clerk, Mr. Amos Thompson, disappeared? Who was the lady who had left a white, expensive-looking glove at the scene of the crime? How is it possible that one of the witnesses, who eventually came forward, claimed to have spoken with the solicitor when the medical examiner said he was dead at that time? Detective-Inspector Furnival of the Yard, known in the force as "The Ferret," is placed on the case, but the inspector seems to be doomed to play second fiddle in every instance of his last recorded case. 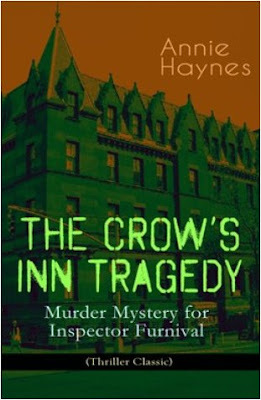 The questions surrounding the murder are easily answered, especially after the halfway mark of the book, but Furnival takes forever to catch up with the reader and Haynes' storytelling is far more memorable than the characterization of her policeman – a gray, colorless character who hardly stands out against the background of the plot. He's practically swallowed by it. Even his last opportunity to shine is stolen by Mr. John Steadman, a barrister and criminologist, who accompanies Furnival on his investigation as an amateur snoop, of sorts, and takes the lead in escaping from the Yellow Gang in the final chapters of the book. So the poor inspector is not given an opportunity to bow out as a hero. I suspect those final chapters, describing the showdown with the Yellow Gang, is not to everyone's taste, which tinges the story with Victorian-era sensationalism and have seen this sequence being compared to Agatha Christie's The Big Four (1927). However, I found these scenes to be far more reminiscent of Dorothy L. Sayers' "The Adventurous Exploit of the Cave of Ali Baba," which can be found in Lord Peter Views the Body (1928). Personally, I found these scenes to be mildly amusing, but they did turn a dark, moody whodunit (as easy as it may've been) into a gaudy thriller from an era that preceded the Golden Age. So not everyone might appreciate this last turn of events. On the whole, I feel somewhat divided about The Crow's Inn Tragedy: I liked Haynes storytelling and how the pall of the war hung over the story, but the plot hardly posed a challenge to the reader. And then there was the thriller-ish ending. The journey to the easily perceived and anticipated ending was much better than the eventual arrival there. So not exactly on the same level as the excellent The House in Charlton Crescent and The Crime at Tattenham Corner (1929), but it was a quick, fairly good read. So far this lukewarm review. Hopefully, I'll have something really good again for the next one. "After all, most people... when confronted with a case of murder, have little but their knowledge of detective stories to guide them." 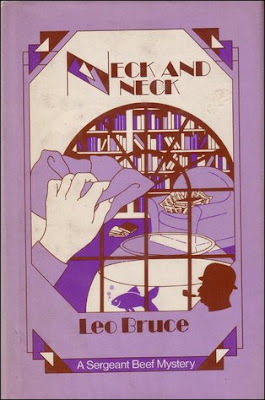 Over the past six months, I reviewed a brace of mystery novels by Leo Bruce, Nothing Like Blood (1962) and Death at St. Asprey's School (1967), but they were about his secondary detective-character, Carolus Deene, who never reached the same heights as his original creation – a former village constable, turned private-investigator, named Sgt. Beef. 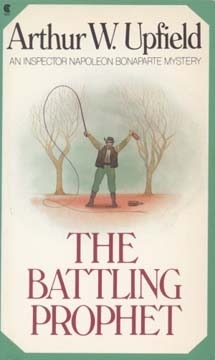 The boorish, beer-chugging and dart-loving sergeant is a personal favorite of mine, but Beef only appeared in eight novels and a dozen, or so, short stories. It's one of those great series that was too short-lived. Luckily, I still had two full-length mystery novels from this series residing on the mountainous region of my TBR-pile. So after two very uneven detective stories from the Deene series, I decided to eliminate one of the remaining Beef novels from my seemingly never-ending list of unread detective stories. Neck and Neck (1951) is the seventh, penultimate, entry in this series and the plot offers a personal problem for the serious, long-suffering narrator, Lionel Townsend, who regularly gets ragged on by Sgt. Beef for his dearth of literary success or lack of confidence in his ability – which is why he has "to play second fiddle to all these other clever detectives." Or so the sergeant assumes. But his personal biographer confides in the reader that he could no longer blind himself "to the fact that Beef was a genius." Townsend had known him first "as a heavy-footed policeman," blunt and boorish, whose methods seemed outwardly slapdash, but he had "prevailed too often to leave any doubt about his really profound cleverness." Now he wants Beef to apply his uncouth methods to clear up the murky circumstances surrounding the sudden passing of his favorite aunt. The story opens with an urgent telegram from Townsend's brother, Vincent, who appeared previously in Case with Rings and Ropes (1940). It informs him that their "Aunt Aurora died suddenly this afternoon," but the telegram is quickly followed by a telephone call, in which Vincent shakily tells his brother that the doctor refuses to sign a death certificate and a police doctor is now on the case. There were also several policemen at the home of their aunt. Apparently, Aunt Aurora "felt terribly ill just after lunch," excused herself, but "by tea-time she was dead," which did not sit well with her doctor and he called in the police – who shared his suspicion and an investigation was started – eventually revealing "a large quantity of morphia" in her system. So she was undoubtedly murdered, but the only viable motive to kill this beloved woman was her money. The bulk of her money was divided between Lionel and Vincent, while a distant cousin, Hilton Gupp, had been cut out of her will. This came as both a surprise and shock to Gupp, because he really needed the money. However, Gupp has an apparently unshakable alibi. Some of the other beneficiaries included a thousand pounds for the Misses Graves, "Aunt Aurora's great friends," who were living well above their means and the local vicar, obsessed with the restoration of church murals, for which Aunt Aurora left five hundred pounds to the St. Luke's Restoration Fund. So Townsend decides to call in Beef and this gives Bruce an opportunity to do a bit of knocking on the fourth wall. Vincent reproachfully remarks how surprise he is at his brother for trying "to make a detective-story-fan’s holiday out of Aunt Aurora's death" and, sarcastically, added that "it will make an excellent novel." After all, Beef usually get to the bottom of it. After his arrival, Sgt. Beef approaches the case with his brash oafishness and blunt questions. For example, he asks the family solicitor, after the funeral, in the presence of everyone else how money "there was in the kitty" and hinting he may need "a new biographer in any case" – since Townsend is as much as suspect as anyone else. It would not be the first time the narrator turned out to be the murderer. However, where Beef genuinely shines in this outing is as the only person to notice an obscure link between the poisoning of Aunt Aurora and "a little affair in the Cotswolds." Before he even appeared in the case, Beef told Townsend he was working on a second case: an unpleasant bibliophile, collector and publisher, Edwin Ridley, was found hanging from a beam in his gloomy home. At first glance, it seemed to be a case of suicide and this worried his brother, a clergyman, because Ridley had taken out a large insurance and this was supposed to go into a trust fund for the children of his clergyman brother – which would not be paid out if it turned out that he taken his own life. So the Reverend Alfred Ridley engaged the services of Beef, but it was the police who figured out the publisher was strangled first and then hung up on a rope. There are more than enough potential suspects: Ridley used his small publishing house to wrench money from aspiring authors by letting them share in the printing costs, but the result was usually no more than a handful of cheaply printed and badly bound volumes. This spelled the premature death of many literary careers. One of these young writers, named Greenleaf, attempted to kill himself over such a "gag" and this makes him an obvious suspect. But that's not all: the secretary of the victim discovers someone has been "monkeying with one or two of the more valuable books" from his late employer’s collection. So there are more than enough potential motives to go around on this second investigation and Beef suggests Townsend makes "one book of the two of them" by letting both cases run neck and neck. Having parallel investigation, which eventually come together, is not an unusual approach to plotting a mystery novel (c.f. Robert van Gulik), but the hidden connection that links both murders is the crux of this plot – which made for niftily constructed plot. Granted, the idea did not originate with Bruce, but Neck and Neck is a good, early example of this plot-device. Only thing that can be said against is that modern readers probably will not be entirely taken in by the trick. You can both guess and deduce the identity of the murderer and how the murders were connected. Nevertheless, Neck and Neck is a genuine detective story with a fine plot and nicely written, which effectively ended on a serious and human note. Overall, this made for a pretty good read from one of my favorite series of detective stories. Sadly, I've only one Sgt. Beef novel left on the big pile: Case Without a Corpse (1937). Guess I'll save that one for next year or so. "What was that somebody said about a bolt from the blue and death coming out of the sky?" Ernest C. Elmore was a theatrical producer, stage director and playwright, who wrote half a dozen fantasy novels, but abandoned both the stage and the fantasy genre to become a prolific writer of detective stories – which he did under the alias "John Bude." Over a period of twenty-five years, the penname of John Bude appeared on the book covers of thirty mystery novels. A literary legacy that, until now, consisted entirely of very rare, often expensive and highly collectible editions. 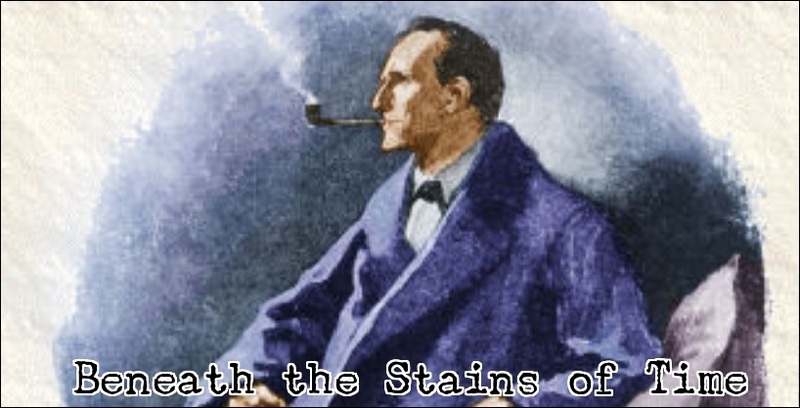 So these detective stories were long overdue for a second trip through the innards of a printing press! 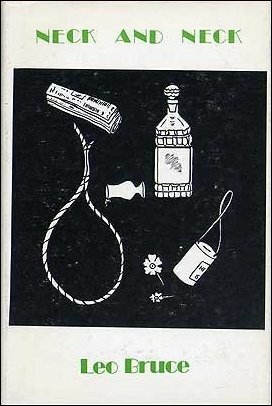 Thankfully, the British Library Crime Classics, an imprint of the Poisoned Pen Press, have made a dedicated effort to pull his work from the bog of obscurity, five of them so far, of which two have been reviewed on this blog – namely The Cornish Coast Murder (1935) and Death on the Riviera (1952). I found them both to be pleasantly written and highly entertaining mystery novels, but the plots were, alas, not of the same grade as the writing or characterization. 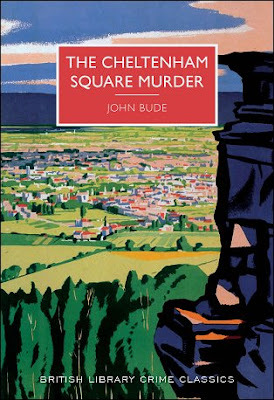 However, the latest book to make a reappearance in this series of reissues, The Cheltenham Square Murder (1937), received some good notices and the plot sounded solid enough. I was not entirely wrong in my presumption. The Cheltenham Square Murder is Bude's fourth mystery novel, but only the third one to feature his series character: Superintendent Meredith of the Sussex County Police. During his third recorded case, Meredith finds himself in a textbook example of the proverbial busman's holiday. Meredith is invited to spend a portion of his holiday in the company of a well-known crime writer and personal friend, Aldous Barnet, who wants draw on the expertise of the superintendent for the book he's writing. As luck would have it, Barnet's sister went abroad and she placed her home at the disposal of her famous brother. So he could work in peace. The home of Miss Barnet is situated in Regency Square, one of the iconic squares of Cheltenham Spa, "that famous and lovely town," which exhales "an atmosphere of leisure, culture and almost rural tranquility." Regency Square consists of ten houses, "erected in the form of a flattened U," but the architecture of these exclusive looking abodes is not uniform. However, the effect is not disharmonious and gives the impression "of a quiet, residential backwater," where old people can grow becomingly older, undisturbed "by the rush and clatter" of the modern world – which has left them nothing more than "the memories of a past epoch." As noted in the opening chapter, outward appearance can be very deceiving and the inhabitants have their fair share of problems. Problems that range from small annoyances to the kind of intrusions that could bring someone to murder. Some of the small annoyances consist of "a minor war" about an elm tree, which divided the square in two camps: one side wants the tree removed, while the others wants to the tree to remain where it has stood for over a century. Other irritations include the insistent hymn-singing of the Watt sisters, the yapping of Miss Boon's pack of dogs and the eternal ringing of Dr. Pratt's telephone-bell, but the real trouble can be found in the household of Arthur West – who was deserted by his wife, lost most of his money and had to put his house up for sale. There are two people at the heart of West's precarious situation: a retired stockbroker, Mr. Edward Buller, who made money off his bad advice to West and a really villainous character, Captain Cotton, who had been swarming around his wife. So you can almost understand when the news reaches that a murder has occurred at the home of Buller, but the true surprise comes when everyone learns the victim is Captain Cotton and the manner in which he died. After all, it did not occur very often that a policeman was confronted, these days, with "the dead body of a man with an arrow embedded in the back of his head." The shaft had entered the room through an open window and the murder weapon, in this instance, does not decrease the pool of potential suspects, because the square is teeming with fervent (amateur) archers – half of them members of the Wellington Archery Club. This aspect of the plot reminded me of Leo Bruce's Death at St. Asprey’s School (1964), which uses a similar craze for archery, at a boy's boarding school, as a convenient excuse to use the classic bow-and-arrow as a murder weapon. It saddles the detectives of both books with a similar type of problem: who was in a position to loosen the fatal arrow and, in the case of this story, how did this person manage to lug around a cumbersome, six-feet bow. But we're getting ahead of the story. First of all, the congenial Inspector Long is the man officially assigned to the case, but he's aware of Meredith's past successes and of the opinion that "two heads are better than one," which makes for a pleasant makeshift investigative duo. Long and Meredith have a mish-mash of case to untangle: such as unearthing all of the potential motives and figuring out who knew Cotton was dropping by Buller. Or if the murderer took out the wrong man by accident. However, the wall safe in Cotton's home was opened and sifted through after his death and this puts both policemen on a small trail of blackmail. 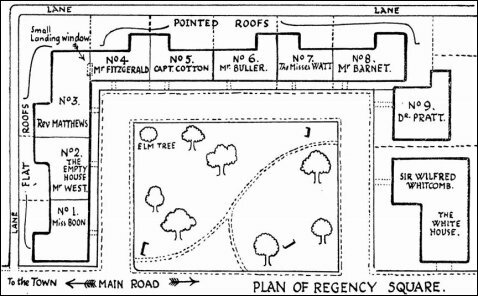 They also have to consider if the felled tree had to make way, so the murderer could have a clear shot, and who had access to the empty home of West. 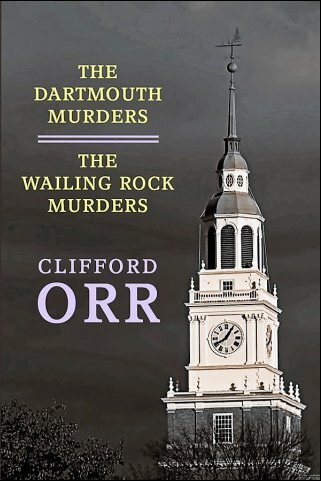 So, all of this, makes for a pleasantly busy and engaging mystery novel, but the strongest and weakest point of the plot is the how-aspect of the murders: there are two identical murders, which pose a number of questions to Meredith and Long, but they clever and deceptively presented – only smudge on this is the lack of fair play. You can figure out who the murderer is, but the, admittedly clever, methods this person employed can only be really guessed at. I made a fairly accurate stab in the dark, but only because a pair of short stories, by Sir Arthur Conan Doyle and R. Austin Freeman, kept popping into my head. Well, I guess John Bude was one of those writers who wrote stories about detectives instead of detective stories. Regardless, I still found The Cheltenham Square Murder to be a pleasantly written, well characterized and reasonably plotted. It was perhaps not one of the fairest mysteries ever conceived, but the plot was noticeable cleverer and stronger than those from the previous two I've read. So I was not entirely dissatisfied with the end result and would recommend new readers, if they're interested, to start with this one. "One's idea must be as broad as Nature if they are to interpret Nature." Back in June, I posted a review of Venom House (1952) by Arthur W. Upfield and concluded the blog-post with the promise to return to his work more often, which, somehow, I actually managed to achieve – posting one review every month since that post. So why not continue down this path? 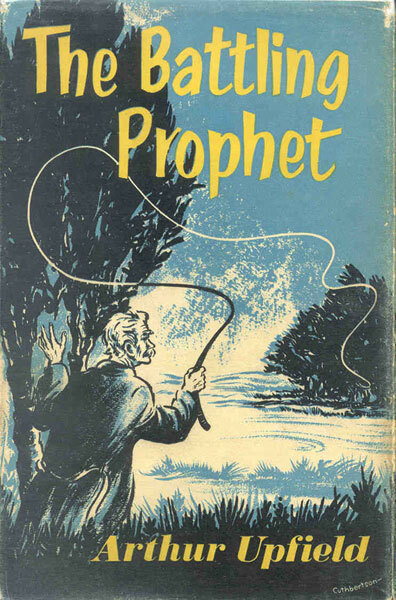 The Battling Prophet (1956) numbers twenty in the series about Upfield's half-caste policeman, Detective-Inspector Napoleon "Bony" Bonaparte of the Queensland Police, whose special abilities makes him the man for "special assignments in the Outback" or "outer urban areas." Originally, the book was published as a serial in a weekly newspaper, The World's News, in 1955, which probably explains one uncharacteristic aspect about this particular entry in the series. One of the hallmarks of this series are the bright, colorful and vividly described backdrops that can be found on the Australian continent. And turning these settings into full-fledged characters was one of Upfield's talents. Over the course of twenty-nine books, Bony traveled to desert lagoons, isolated cattle stations, lonely swamps, valley towns and braved the parched, treeless grounds of the Nullarbor Plains, which impressed on the reader the sheer size of the continent, but a large chunk of The Battling Prophet takes place in-and around a small cottage – giving off the impression that you’re reading a novelized version of a stage play. The cottage in question belongs to eighty-four year old Mr. John Luton, a man of the old guard, who represents a dying race of men "who had left their mark so indelibly on the Outback." A stock of men "the like of which will never again be seen," because they "were born long before motor traction could weaken their bodies" and "the craze for luxury and mental distraction" came too late to get a firm grip on their minds, but they were prone to some of the old-world weaknesses – such as an Australian predilection for blackout drinking. However, even these drinking binges were done in accord with old-school rules: an observance that's "a relic from the old days" when hard workingmen would go on a weeks-long drinking spree after a long, self-imposed period of abstinence. Tragically, the last of these benders at the riverside cottage resulted in a casualty. Ben Wickham is a long-time friend of Luton and had as many enemies as admirers, which he accumulated during "a stormy career" as a pioneer of modern meteorology. During the 1950s, the science behind modern, long-range weather forecasts was still largely theoretical: the plans from the 40s to launch cameras in orbit, to observe weather and cloud patterns from space, would not come to fruition until April 1, 1960 – when the first weather satellite, TIROS-1, was launched. So to be able to make accurate forecasts, before the dawn of the space age, has serious (geo) political implications. Wickham has a weather record, dating back five decades, which allows him to make accurate prediction about the weather four, five or even six years ahead. One of Wickham's recent victories was the spot-on prediction about a great draught, but the accuracy of this forecast earned him as much scorn as admiration. As a result, the farmers who took Wickham seriously did not fallow their land, sown crops, bought manures, hired farm hands or took out any loans – which saved many of them from potentially bankrupting themselves. However, the people who had a financial or political interest in the farmers spending all of their money were not amused. Not amused at all. This is the reason for Luton's refusal to accept that Wickham had "died in the hoo-jahs of alcoholic poisoning," which he slipped into after one of their drinking spells, but was killed on account of him preventing the enslavement of farmers and graziers by "the big merchants" and "the banks." So on the recommendation of his neighbor, Knocker Harris, the old man dispatched an urgent letter to Detective-Inspector Napoleon Bonaparte. Upon his arrival, Bony is confronted with the first of many complications and obstacles: if it is the murder, the culprit was clever enough to fool both the local doctor and the medical examiner from the police department. A death certificate was signed, stating Wickham had died "from heart disease accelerated by alcohol," after which the body was cremated and the dust scattered to the four winds. A perfect murder! A good security for the murderer, but, regardless, someone starts pulling strings and Bony finds his own police apparatus is starting to work against him. Officially, Bony is on a fishing holiday and a guest of Mr. Luton, but rather quickly begins to receive urgent summons to make an early return to duty – orders he ignored and this makes him eventually a wanted man. But that's not all. Bony and Luton find themselves confronted with a couple of foreign agents, from behind the Iron Curtain, who proved to be prone to violence and prefer to enter a room with a gun in hand. I think this betrays the episodic nature of the story's original run as a newspaper serial, but makes for a fun, well-paced yarn. And loved how much Bony was enjoying his precarious situation. By the end of the book, Bony should've been so deep in trouble that it would've taken a platoon of gravediggers to get him out of it again, but he simply lifts himself out of the hole. How? Bony blackmails all of the involved police organizations and government branches by threatening to expose their, less than legal, activities. This makes for an excellent closer and recalled Rex Stout's The Doorbell Rang (1965), in which Nero Wolfe and Archie Goodwin also use the illegal activities of a government agency (i.e. FBI) to close a case. So all of this makes for a good and even excellent read, but there's one blemish that keeps The Battling Prophet from a place in the first rank. The revelation of the murderer was anti-climatic and was not really connected to any of the other plot-threads, which was slightly disappointing. I found the background of the victim fascinating and the murder should really have been tied to his activities as a meteorologist. Unfortunately, The Battling Prophet ended on a slightly disappointing note, but the journey to the final chapter was not bad. There were some pretty good or fun scenes. One of them has Bony telling Rev. Weston about his past, while they cast a fish line, which recounts his birth and how he acquired his peculiar name. Bony alluded to his origin in other novels, but this telling of his story seemed to have a bit more details. I also liked the scene when has inside a hidden cellar listening to a policeman making enquiries about his whereabouts. As I noted, Bony was having far too much fun in this outing. To sum this overlong review up, I would not recommend readers who are new to the series to start here, but fans of the series will find this an interesting inclusion in Bony's casebook. 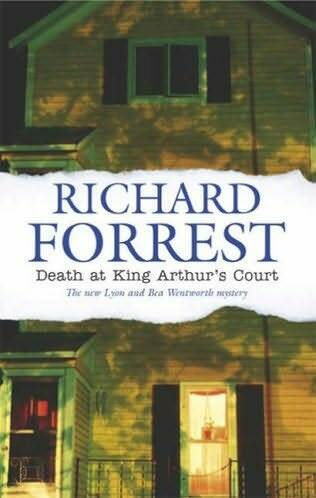 Recently, I reviewed A Child's Garden of Death (1975) by Richard Forrest, which marked the debut of his husband-and-wife detective team, Lyon and Bea Wentworth, as well as the first one to feature an impossible crime – of which there are five in this ten-book series. Some of them have very alluring sounding premises (e.g. inexplicable vanishing of an airplane and a disappearing houseboat). So, naturally, I felt attracted to the series and A Child's Garden of Death, in spite of its imperfections, deserves praise for attempting to bridge the gap between detective stories from the Golden Age and those from the post-World War II era. 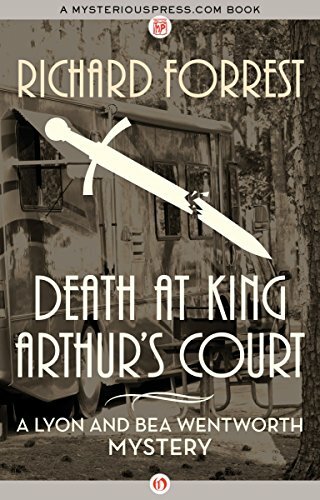 In any case, the book warranted further investigation and almost immediately decided on which one would be next in line: the last one from the series, Death at King Arthur's Court (2005), which was published posthumously. Inferring from the dated plot-thread about the fax machine, I strongly suspect the manuscript was initially rejected by his publisher and spent the next decade as drawer stuffing. Nevertheless, the summary of the plot was promising a story with a solid locked room problem, one with "a medieval twist," involving a hooded figure wielding a broadsword and the shadow of suspicion falling on Lyon – who could end up on death row. So how I could possibly resist? But let's start at the beginning. Lyon is an author of children's literature and created the Wobblies, "a pair of benign monsters," while his wife, Bea, is an "unflappable state senator." One whose rising star is starting to get noticed across state lines. They live in an eighteenth century house, called Nutmeg Hill, which stands in the Connecticut town of Murphysville, but the small, deceivingly peaceful town has a homicide rate that competes with that of Cabot Cove and Midsomer County. Usually, they find themselves involved in these local murder cases. During their first recorded case, Lyon and Bea were drawn into an official police investigation by a close friend, Police-Chief Rocco Herbert, but in their final outing as detectives they find a problem in their own driveway – inurned inside a completely sealed, armor-plated RV! Warren Morgan, a professor at Middleburg University, has been receiving death threats from "a bunch of disgruntled college dropouts," who refer to themselves as the Brotherhood of Beelzebub, which went as far placing "a hundred grand bounty on Morgan." So the professor went full A-Team on an old RV and turned the vehicle into "a rolling fortress." The front doors had been strengthened with interior braces, the windows were replaced with "the special safety glass utilized on armored cars" and could be covered steel shutters. A steel shield had been welded under the chassis and a giant air-conditioning unit was sunken into the roof, requiring the combined strength of "four or five very strong guys," which has an air-filtration system built into it – making it impossible to gas him through the air vents. Finally, the only door has a combination lock and there are only two people with the right combination: Morgan and Lyon. The final result is a vehicle with "all the protection of an army tank" and "the interior comforts of hedonist's house trailer," which was parked for extra security on the driveway of the Wentworth home. However, every effort to protect himself proved to be wasted money and energy: someone penetrated a seemingly impregnable fortress and butchered the professor with his own broadsword. He used the sword as a prop in one of courses in Arthurian legends. Around the same time as the murder, Lyon found himself in the nearby woods, dazed and confused, but he also feared for his life: a hooded figure, in a robe, wielding a medieval-looking sword was pursuing him with the clear intention of separating his head from his shoulders. Strangely, the figure of his executioner "disappeared into the darkness as quickly as it had appeared." When Lyon emerged from the woods, hunched, bloody and dragging a long sword across the grass, he tells a waiting Rocco Herbert that something had happened to him, but he was "not sure what." However, Captain Norbert of the State Police suspects Lyon of murder. After all, Lyon was covered in blood, carried a broadsword and knew the combination of the lock on the door. So you would expect that, from here on out, the plot would center on exonerating Lyon, but here is where the book began to flip-flop – shifting the focus of the story into a different direction. Lyon avoids immediate arrest and the next couple of chapters have him recounting the events from the day and evening, which introduces a number of potential suspects. First of all, there are two feuding literature professors from Middleburg University and Margon's half-brother and sister, twins, who are under his financial control, but there’s also a redheaded stripper from Boston and mother of Morgan's son – who wants to secure a future for their child. This gave the narrative an entirely different tone and the story never returned to the one set forth in its opening chapter, in which Lyon was attacked by the sword-wielding figure. It turned the book from a dark persecution story into a more lighthearted whodunit in less than two chapters. Actually, the opening of the book and the chapters recounting what happened on the day preceding the murder recalled some of the Jonathan Creek episodes from the 1990s (e.g. Danse Macabre, 1998). After these chapters, the State Police receives a letter, written in red ink, which claimed responsibility for the murder ("Satan has been gloriously revenged") and Lyon is let off the hook. Once more, this changed the tone and direction of the story: there are a number of additional murders, one by sniper fire, and the reader learns of a person who has designs on Bea. First by stabbing or shooting her in public and eventually by planting a car bomb. On top of that, Lyon and Rocco have to deal with the slightly unhinged personality behind the threatening letters, which involved the plot-thread about the fax machine, but this was basically a side distraction and an excuse to introduce some thriller-ish material – such as tossing around a hand grenade. I actually liked that fun little scene, but there's no way they could've pulled that off in less than four seconds. Anyway, this moves a great chunk of the second half of the book into the territory of the modern thriller and crime novels, which was reflected in the poor and disappointing conclusion of the book. The murderer was both obvious and slightly mad. So don't expect too much from the who-and why part of the plot. There is, however, one aspect of the plot I loved: the explanation for the locked room murder. If you want something different in a locked room mystery, you'll find it in this part of the plot. The solution wonderfully uses such aspects as the weight of the armored vehicle and some, eh, external factors. Forrest excellently clued and foreshadowed how the trick was pulled off, which he subtly spelled out to the reader in the opening chapters, but you've to be very alert and perceptive to put one and one together. Sure, the idea behind the locked room trick is simpler than its execution, but that does not take away from the fact that Forrest found a fairly original way to enter and leave a sealed environment. So, yeah, Death at King Arthur's Court has a strong opening, a shaky, uneven middle section and a disappointing ending, but with a good and solid impossible crime plot. I guess I can only recommend this one to locked room enthusiasts. Other wise, you can safely skip this one. Well, I'll try to find something better and more classical for the next blog-post.